Thirty-five years ago today — January 15, 1976 — a Titan-IIIE rocket with Centaur upper stage launched from Cape Canaveral carrying the Helios-B spacecraft on a unique deep-space mission. Helios-B was developed by the Federal Republic of Germany, but as a cooperative program with NASA it carried both German and U.S. experiments. Its mission was to characterize the “interplanetary medium” inward from Earth’s orbit. Within only a few months, Helios-B had reached perihelion — the closest point in its orbit to the Sun — at a distance of 43.432 million kilometers (26.987 million miles, or 0.29 astronomical units), meaning that it was closer to the Sun than the planet Mercury. That’s the closest any space probe has ever gotten to the Sun. Fast forward 30 years, to January 15, 2006, when the Stardust capsule returned to Earth with samples taken around the vicinity of Comet Wild-2. Scientists have been studying the materials trapped in Stardust’s aerogel, with surprising results including “a remarkable set of minerals that form at extremely high temperature” and the amino acid, glycine. Pretty amazing, considering the capsule entered the Earth’s atmosphere at over 28,000 miles per hour: the fastest-ever reentry of anything we’ve ever sent into space. In other news, the first day of the MarsCon science fiction & fantasy convention went well. (Nothing like showing up at a panel to provide moral support and being invited to participate.) Today I’m sequestering myself, trying to finish writing a short story before I venture back out. That’s my next task, as soon as this post is live … wish me luck. Thirty-five years ago today — September 9, 1975 — the Viking-2 orbiter and lander were launched on their way to Mars by a Titan-IIIE booster out of Cape Canaveral. The first Viking lander had been launched a few weeks earlier, as noted in this blog post. Viking-2 landed about a year after launch at Utopia Planitia. Fans of many Star Trek iterations will recognize Utopia Planitia as the place starships are built — with facilities on planet and in orbit above. For more information on the science fictional Utopia Planitia Shipyard, try this Memory Alpha page or this starship guide. We haven’t really gone “a-viking” to another world (yet), but 35 years ago today — August 20, 1975 — we did launch the Viking-1 mission from Cape Canaveral. 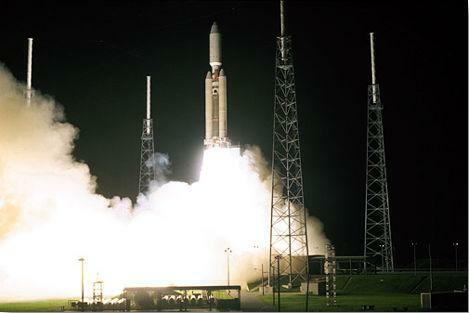 Viking-2 was launched a few weeks later, on September 9th. Launched by Titan-IIIE boosters, the Viking missions each consisted of a lander and an orbiter. 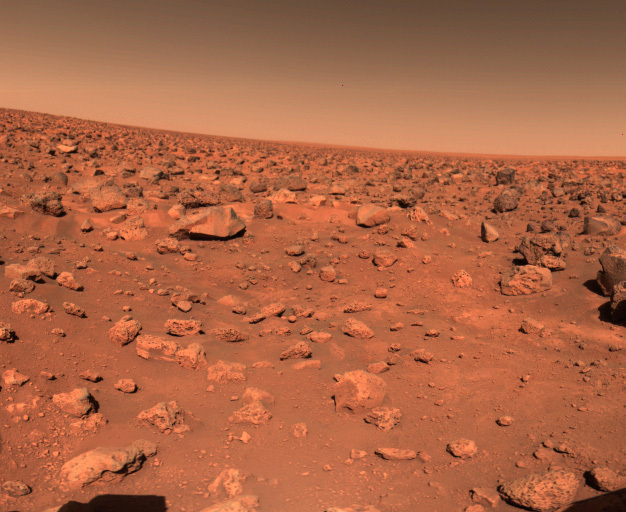 In addition to cameras that returned stunning images of the Martian landscape, the Viking landers carried instruments to study the Martian surface in terms of biology, chemical composition, meteorology, seismology, and other properties. Viking-1 entered Mars orbit on June 19, 1976. The orbiter and lander orbited Mars together for a month while the orbiter took images which NASA used to select a landing site. The lander and orbiter separated and the lander descended to the surface on July 20th. Other than the failure of the seismometer and difficulty with a stuck locking pin on the sampler arm, all of the experiments on the Viking-1 lander performed well. The lander “was named the Thomas Mutch Memorial Station in January 1982 in honor of the leader of the Viking imaging team.” Contact with Viking-1 was lost on November 13, 1982. > Thank you so much for taking the time to think about and submit your proposed solution regarding the Horizon incident. Your submission has been reviewed for its technical merits. Unfortunately, the team has determined that your idea cannot be applied under the very challenging and specific operating conditions we face. All of us on the Horizon Support Team appreciate your thoughts and efforts. What amuses me is the phrase “cannot be applied.” I’m aware of “the very challenging and specific operating conditions,” since in 1993 I directed a search-and-salvage operation in the Pacific Ocean for pieces of a failed Titan-IV rocket; based on that experience, I still think my idea is feasible. But because it would render the undersea wellhead unusable forever, it is most certainly undesirable to the powers that be. I could be wrong; it wouldn’t be the first time, nor the last. Nevertheless, I think the kid gloves should have come off a long time ago. By not making the situation better, the people in charge are definitely making it worse. Twenty-five years ago yesterday* — April 29, 1985 — the Space Shuttle Challenger lifted off from Kennedy Space Center on mission STS-51B. Astronauts Robert F. Overmyer, Frederick D. Gregory, Don L. Lind, Norman E. Thagard, William E. Thornton, Lodewijk van den Berg and Taylor G. Wang launched the student-built Northern Utah Satellite (NUSAT-1) and spent a week in space with the European Space Agency’s Spacelab-3. And on April 29, 2005 — 5 years ago yesterday — the last Titan-IV to be launched from Cape Canaveral Air Force Station blasted off with a classified National Reconnaissance Office satellite aboard. 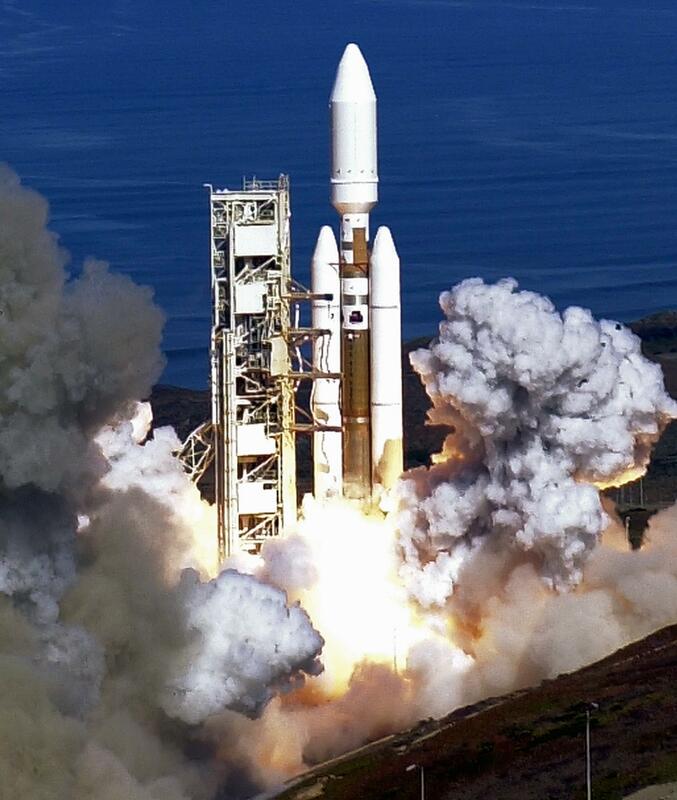 Titan rockets had been launching military and civil payloads for nearly five decades, and this launch left one final Titan-IV in the inventory, which launched from Vandenberg AFB in October 2005. Forty-five years ago today — March 23, 1965 — astronauts Virgil I. “Gus” Grissom and John W. Young launched from Cape Canaveral on Gemini Titan 3. It was the first manned Gemini flight and U.S.’s first two-man spaceflight. Grissom constantly complained about the dehydrated delicacies concocted by NASA nutritionists. He was willing to eat the reconstituted food only because there was nothing else available. Or so he thought. Gus had no idea that John Young had more than just souvenirs stowed in his space suit pockets. Introducing my second foray into songwriting: “The Economic Recovery Blues,” the 2009 Industrial Extension Service (IES) Song, now available on YouTube. Friends from the Titan System Program Office at Vandenberg AFB may remember that I penned quite a few Titan-related lyrics to Beatles tunes, but “The Economic Recovery Blues” was only the second time I’ve tried to write lyrics and something of an original tune. Back in late 2008, my first attempt was “The I-E-S Song” — I wrote the lyrics and had the basic tune in mind, and Mark Minervino (my Pastor at North Cary Baptist Church) fleshed out the music. He also did all the instruments and the background vocals — his versatility is boundless — and I just sang the main lyrics. Then I put together a video montage and showed it off at our annual Christmas luncheon. The original “I-E-S Song” was a big hit with the folks at work. Several of us wanted it to go on YouTube, but the humor was a little too sharp — mostly self-deprecating, but it got in digs at some other North Carolina institutions of higher learning. Maybe the powers-that-be will change their minds one of these days. I had so much fun doing the first “I-E-S Song” that I figured, why not do another one? So in December 2009 the process repeated. I had the lyrics and the beginning of a tune, and Mark figured out (and performed!) the rest. Because I didn’t get started as early as the first one, we didn’t get this song done in time for the IES Christmas luncheon, so at that I sang another song — this one a work-related lyric sung to “Oh, How I Love Jesus” — and then finished up “The Economic Recovery Blues” over the holiday break. The video montage is rougher than the first one,* but the office folks decided to post it “as is.” So this is the first song I’ve done to be posted online. Hope you enjoy it, if you go in for that sort of office-related-silliness thing. *A note on the video montage. For the first one, we purchased some nifty graphics off the web; for the new song, I used Creative Commons images and put attributions in the credits at the end of the song. Spacecraft don’t celebrate Christmas (so far as we know), and the laws of motion don’t, either. So it happened that five years ago today — December 25, 2004 — the European Space Agency’s Huygens probe was at the right point in its journey to detach from the Cassini spacecraft and head toward Saturn’s moon, Titan. The Huygens probe landed on Titan on January 14, 2005. It’s interesting to me that the Cassini spacecraft, which carried Huygens to its rendezvous with Titan and has returned spectacular images of Saturn for the last five years, was launched from Cape Canaveral on a Titan-IVB rocket. I remember it well; before it was launched, some groups protested because of the radioactive plutonium in Cassini’s radioisotope thermal generators (as noted in this CNN story). Kudos to my old compadres on the Titan team for that successful launch!